OmniVest Properties Management was founded in October 2000 by B. Robin Eglin with a mission to provide expert services in every area of school management and real estate development. OmniVest is a unique, multifaceted company that is truly unlike any other company in existence today. It houses a full range of comprehensive services ranging from assisting charter schools locate, finance, design, and construct their schools to providing comprehensive real estate and financial services to a variety of clientele — all in a cost effective and time sensitive manner. In fact today, OmniVest is a premier provider of charter school educational management and financial services as well as a successful developer of commercial and charter school real estate across the country. Mr. Eglin is Founder, President, and CEO of OmniVest Properties Management, LLC. Bringing over 30 years of experience in education management and real estate development, Mr. Eglin has combined his diverse school management and real estate experience to create a diverse and unique company which services a wide variety of organizations throughout the United States. 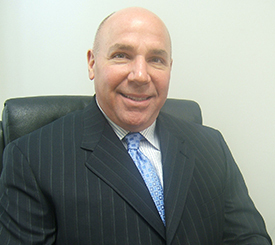 Graduating from New York University in 1978, Mr. Eglin began his career in commercial real estate. He was involved in the development of 16 Jiffy Lube Service Centers nationwide and a variety of multi-story parking garages such as Bally's Park Place Casino Hotel, Barnett and Flagship Banks, Hyatt Regency Hotels, and Omni International Resorts, just to name a few. For the past 20 years, Mr. Eglin has focused his vast real estate expertise in the for-profit and non-profit education field. In 1987, he joined Pennsylvania Blue Shield to form a private school division called Carefree Learning Centers. During his tenure at Blue Shield, Mr. Eglin grew this division, developed and was responsible for the operations of twelve high quality preschools in Southeastern Pennsylvania. Continuing in the education management field, Mr. Eglin joined Nobel Learning Communities, Inc. (a national for-profit education company) in 1994. He quickly became President of Nobel Learning Communities, Inc. and was responsible for the day-to-day operations of the company's specialty school division which included charter schools, alternative high schools, and special education schools nationwide. To date, Mr. Eglin has fully developed approximately 125 new preschools, elementary schools, middle schools, and charter schools throughout the country. Mr. Eglin is currently Chief Financial Officer and an advisory board member for People For People Inc., a non-profit community based organization in North Central Philadelphia.